In 1838 the headquarters of the Mormon Church was located in western Missouri. Mormons began arriving in this state in the early 1830s settling in Jackson County, around the city of Independence. However, trouble erupted between the Mormons and the non-Mormon Missourians, which resulted in the Mormons being forced out of Jackson County in 1833. Many were welcomed to Clay County, across the river to the north, where they settled and made new homes. A couple of years later, when new troubles between the Mormons and non-Mormons began, a peaceful settlement was negotiated as the state provided the Mormons a county they could call their own. The formation and settlement of Caldwell County brought about a year and a half of peace – and even friendship — between Missouri’s Mormons and non-Mormons. But as Mormonism grew, so many coverts gathered to Missouri that the boundaries of Caldwell County couldn’t hold them all. So contrary to the terms of the peace agreement, Mormons began settling in other counties. Thus, in 1838 hostilities began yet again. Non-Mormons started getting nervous as Mormon settlements expanded and Mormon leaders proclaimed war-like rhetoric against dissenters and non-Mormon settlers. 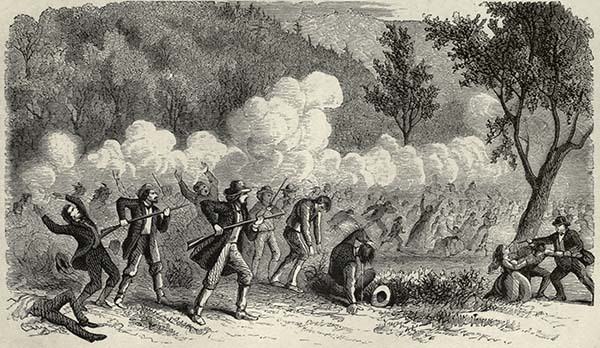 Once again, tensions and conflict increased on both sides, and eventually an armed force of Missourians displaced the Mormon settlement of DeWitt (in Carroll County). Once again, the Mormons packed up their belongings and headed to another county, this time to the Mormon settlement of Far West, Missouri. Indeed, the Mormons had had enough. Lyman Wight, a militant LDS Church leader in Daviess County, commanded a Mormon force of 350 men. Their task was to follow orders given by Joseph Smith to drive the non-Mormon residents out of Daviess County by force (135). Mormon raids against the non-Mormons continued. At Gallatin the Mormons “took all the valuables and set the buildings on fire.” Mormon leader David Patten warned that all non-Mormons must leave Daviess County or face death (139). In his book, Mr. Kinney related more stories of devastation wrought by Mormon troops. A doctor named Samuel Venable delivered a baby whose mother had been driven from her home while she was in labor. While the Mormons robbed and plundered her home, the woman traveled eight miles to neighboring Livingston County where she found a doctor at a campground hastily set up for refugee relief. While treating patients, the doctor saw another fleeing woman arrive at the campground carrying her four-day-old child (140). Mormon marauders left Daviess County and plundered citizens in Livingston County as well. Mr. and Mrs. White, who had set up the refugee campground, suffered a Mormon raid when their home was plundered, their oats and corn confiscated to feed the Mormons’ horses, their fences torn down, and their standing crops destroyed (140). All of this (and more) led to Sheriff William Morgan’s distressed October 21st letter to Missouri governor Lilburn Boggs pleading for help. “Our country is in a desperate situation [the Mormons] are burning and driving as they go,” he wrote (139). The days that followed were filled with more threats, more rhetoric, and more Mormon raids. 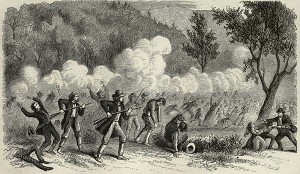 The culmination of this escalating violence came on October 30th when 17 Mormon men and boys were killed in a skirmish with Missouri militiamen at Haun’s Mill in Caldwell County. News of this tragic loss of life caused Joseph Smith to surrender, finally bringing an end to the Mormon War. Who started all this trouble in Missouri? At whose feet can the blame be laid? Latter-day Saints generally blame the Missourians. Mormons share stories with one another of the way their people were mistreated, of how they suffered at the hands of their Missouri enemies, and of the injustices perpetrated against them. And they are right – they were mistreated, they did suffer, and their concerns were unjustly handled. However, as the examples detailed above demonstrate, the Mormons also mistreated people; they also caused suffering; and they also perpetrated injustices. During those terrible weeks of October 1838 the Mormons went on the offensive. They sought to fulfill what Church leader Sidney Rigdon said would be “a war of extermination; for we will follow them till the last drop of their blood is spilled, or else they will have to exterminate us; for we will carry the seat of war to their own houses, and their own families, and one party or the other shall be utterly destroyed” (July 4, 1838; 90). An objective look at this history reveals provocation, violence, and injustice on both sides of the conflict. As much as Latter-day Saints may want to imagine their early Mormon brethren wearing the white hats, no clear-cut good-guys-vs-bad-guys scenario existed in this Mormon War. This entry was posted in Early Mormonism, Mormon History and tagged Brandon G. Kinney, Church of Jesus Christ of Latter-day Saints, Latter-day Saints, Mormon Church, Mormon History, Mormon War in Missouri. Bookmark the permalink. I’m shocked to learn that there were actions and grievances on both sides. Shocked! Not really. Anyone who follows a sports team should understand that people are people and they act and respond in predictable ways when threatened. There are always two sides to a story. There are almost always good people on either side of a debate or conflict. The way the Church white-washed their history, claiming the early Mormons just showed up in Missouri, peacefully minding their own business never did wash with me. That’s not how conflicts deepen. Acts lead to reactions. Self righteousness and hatred is all either side can see. The Mormon history was painted by Mormons, of course they are going to paint it differently (white-wash) than the Missourians. That’s what arises out of conflict, self justification. We should consider this when we attack or debase people on the internet whose views we disagree with. Attacking their beliefs only leads to an increase in their belief system and hostility towards you. Even though intentions were good, it’s not an effective technique. Really the only way to change comes from knowledge. Not knowledge of facts, knowledge of each other. Friendships, not hatred. Find common ground. Because as soon as you you start selling your point you are no longer a friend, you are a salesman with a pitch. And that’s not Christ centered behavior. That’s coercion. I love this site because it makes me think and is very well written. But I had to seek it out. Shoving facts down my throat before I was ready would have made no impact with me. In fact it likely would have entrenched my beliefs. Keep this in mind when we deal with those whose beliefs vary from our own. Bringing facts to an argument, though well meaning, doesn’t change beliefs. It entrenches them. My entire family believes in the LDS Church. Showing how wrong they are does not work. At all! I have to love them no matter what and be there when they come with sincere questions. Hopefully eventually. I think it’s also a great read for all those who enjoy engaging religiously and politically in social media. 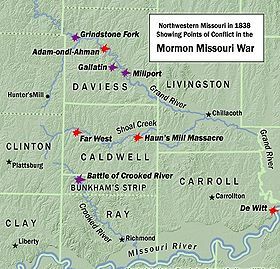 It’s worth noting that the violence in Missouri involved Mormons attacking other Mormons, and the birth of an LDS vigilante group known as the Danites. One of their goals was to drive out or kill all LDS who disagreed with the LDS leadership. From this perspective, one could say that the Mormons have mellowed a bit. They don’t kill dissenters anymore. You brought up a great point , a reminder , that Mormons deserve to be loved and respected by those seeking to reach them for Jesus . Anyway , thanks for the reminder to treat Mormons with love and respect — they deserve that . Understanding history is all about grasping the context of any situation. People, in those days, could be extremely violent. Check out the Nate Turner rebellion, John Brown’s assault on Harper’s Ferry Federal Arsenal and Bloody Kansas. Add in the Mountain Meadows Massacre. What went on in Missouri was much like a gang war; the Crips vs. the Bloods. Whoa, now. Comparing the 1838 “Mormon War” to the Crips and Bloods may be just a tad unfair to both sides. I’d say it was more like the Union and the Confederacy, with both sides having legitimate grievances against each other. From the Mormon perspective, they were getting hassled and shot at by slave-holding Southern border ruffians. In a sense, it was something of a prelude to the Civil War twenty years later. Sounds a bit like how Europeans treated native Americans, being honest. But the point is the same: neither side was really innocent. Claims of persecution is a good way for an organization to keep the members tight and committed. It doesn’t really matter if the persecution is real or just claimed, the effect will be the same. In cults, the claim of persecution serves as a way of reinforcing within people the idea that the cult is true, strange as that may seem. In the case of LDS, while they are not being persecuted today, they can appropriate the persecution of the past and enjoy its emotional benefits. I sat in the “murder room” of the Carthage Jail, actually right next to the window Joseph Smith jumped out of as he was shot trying to escape the mob. I asked the Mormons present, “What was the precipitating event that resulted in Joseph Smith being jailed?” They said, “Because the church was being persecuted.” I persisted and got the same answer. It told me that these folks had no idea why he was jailed. If people are ignorant of the facts of history, they can be made to believe anything. In this case it was the persecution claim. I wonder what effect the truth might have had on them?